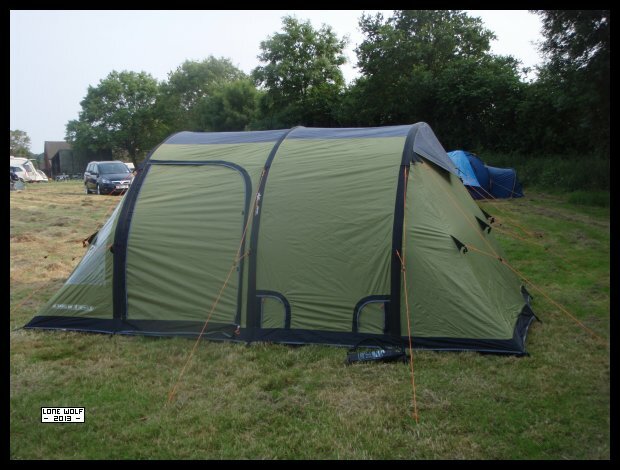 My new Vango "Kinetic 500" inflatable tent down at the 'Dashers. Tuesday and I took the Guzzi over to Rex Caunt Racing for some Bantam engine bits. Wednesday and Wayne Gardner came round and picked me up - by nine o'clock I was full of local anaesthetic and sedative. The saga of the "tooth that would not die" had finally ended. By dinnertime we were both in the cafe. Thursday saw three Royal Enfields going on a tour of the Peak District. I had to be back before five to pick up my prescription for new painkillers. The weekend saw my first attempt at camping since the accident. Loaded everything into the trailer and set off for the 'Dashers. it away is just not possible for me to do on my own. This means that if I need to dry the tent out when I get back home . . . .just ain't going to happen. I haven't found a solution to this particular problem yet.